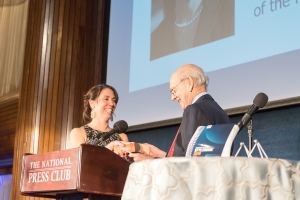 Supreme Court Justice Stephen Breyer administered the oath of office to new National Press Club President Alison Fitzgerald Kodjak at an inaugural gala dinner Saturday. National Press Club President Alison Fitzgerald Kodjak told a soldout ballroom audience Saturday that she wants to widen the Club’s role protecting freedom of the press to include gaining greater access to government information so people can know what their government is doing. “Any journalist who covers government knows that for years now, it’s become harder and harder to get any good information from our government and to find out what our public servants are doing,” said Kodjak, who was sworn in as the Club’s 112th president. “We can’t have representative democracy, government by the people” if they don’t know what’s happening. Kodjak, a National Public Radio health policy correspondent, said she is expanding the Club's Press Freedom Team so it can speak out forcefully on freedom of information issues. A Club priority this year, she said, “is to locate and secure the freedom of freelance photographer Austin Tice,” who disappeared in Syria six years ago, having worked for The Washington Post and the McClatchy group. The Club is also working with journalist Emilio Gutierrez’s attorney to ensure he remains in the United States after U.S. Immigration agents threatened to deport him. Gutierrez received the Club's John Aubuchon Press Freedom Award on behalf of his fellow journalists in Mexico. In remarks before administering the oath of office to Kodjak on her worn Italian dictionary, Supreme Court Justice Stephen Breyer praised her selection as president, noting that she’d overcome childhood adversity, before giving a mini-tutorial on the First Amendment. It “traces out a system of government,” he said, that is like a transmission belt. Freedom of religion is first because it’s “the freedom to think” and give voice to ideas. Rhetorically asking why freedom of the press comes next, Breyer said that the ideas you express can be “transmitted” to the press and distributed. That system along, with the right to assemble and petition government, is “the only way government works.” However, it’s not only up to judges like him to enter high schools and explain it. The evening’s host, Associated Press editor Lisa Nicole Matthews, used playful, deft touches to move the program along, including an invented NPR quiz of “Wait, Wait Don’t Tell Me” all about Kodjak.